With the help of a program recently launched by OCAS, Curtis and many other active and retired military personnel, as well as their families, have found their perfect furry friend to bring home. The program waives adoption fees for active military and veterans as a way of saying thank you to those who served our country. This year, the initiative has helped 112 Orange County shelter dogs and cats find new homes with military families. Curtis had adopted from OCAS before. The older dog he adopted recently passed away, but Curtis said his companionship helped him battle with post-traumatic stress disorder. Today, Curtis met a gray mixed-breed dog without a name. The stout, handsome dog is estimated to be three years old. The pup has not been at the shelter long, but the marks and scars on his body reflect a much harder life before his arrival at OCAS. One challenge the gray mix faces is his heartworm positive condition, which can be a deterrent for prospective adopters. While heartworms are treatable, the cost and commitment of care is sometimes greater than a family is able to manage. Fortunately, the Don Mealey Chevrolet family, who are proud supporters of shelter animals, agreed to cover the costs to treat Curtis’s new companion. 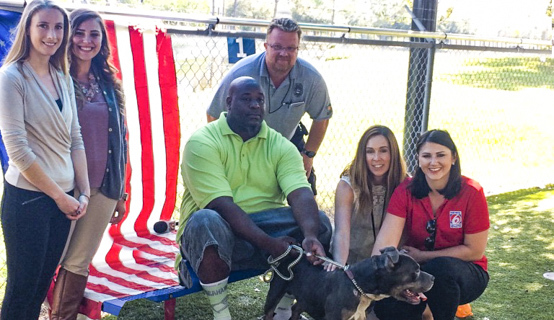 WKMG News 6 interviewed Curtis and OCAS staff to share their special story. To learn more about adoptions at Orange County Animal Services visit them online at www.ocnetpets.com.